Working with Dentsu Y&R Tokyo, Dole drew attention to its sponsorship of Sunday's Tokyo Marathon by turning bananas into wearable devices that displayed the runner's time and heart rate, as well as motivational tweets. and the Lakatan type at the finish line. 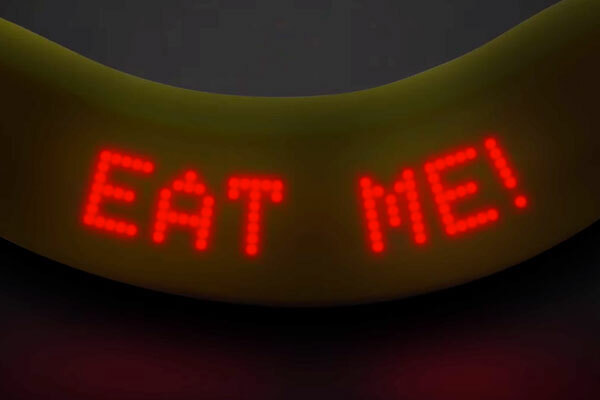 To draw attention to the above activity, the brand and agency created a wearable banana by slicing open a banana, placing LED modules under the skin, and stitching the fruit back together. Thus upgraded and wired into a device all runners wear for monitoring purposes, the fruit was capable of displaying the runner's time and heart rate, motivational tweets and even advice about when to eat another banana for optimal performance. Two runners wore the wearable device, which maintained its "edible functions" (the creators reportedly stuffed a smaller banana inside the original skin along with the electronics), during the race. The fruity story, along with the video below, earned "a great deal of mentions and attention" in Japanese media as well as coverage by at least 26 international outlets including The Wall Street Journal, Engadget and CNet. At last year's Tokyo marathon, the brand and agency turned bananas into personalized commemorative items by printing runners' finishing times onto the fruits—work that won the PR Grand Prix at Spikes Asia.